Thank you so much for stopping by on this Hallow's Eve! We, the author's of Freebielicious, all have a treat for you that you can, hopefully use in the in your classroom this November. 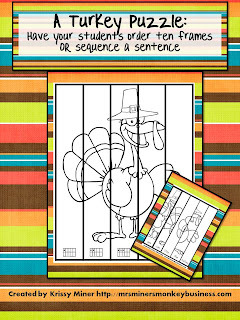 I created a fun turkey puzzle that students can put together by cutting out the pieces and ordering ten frames OR ordering a simple sentence. My students always love these puzzles and it encourages using many different skills to complete it! Oh no! A reader just noted that the link isn't working...I'm at school, so I can't fix it until I get home to my other computer! Make sure you come back tonight to grab the freebie...sorry folks! Now, swing on over to Kindergarten Smiles to check out the next freebie treat from Caitlin! Thank you for sharing! I can't find where to get it though. Is it through your blog or Freebie-licious? Thanks a lot for the freebie, just to let you know that the link is working now!!!!! Awesome idea for tonight!! Thanks for the freebie! This turkey puzzle worked like a charm! The more capable students focused on the words of the sentence and were able to place the pieces together. Those who were not developmentally ready focused on creating the picture! Fantastic! Another winning activity. Thank you so much.